Aluminium powders are fantastic due to their shiny silver nature and the fact that they impart excellent hiding power. This is the reason we use them in all our metallic paints. Normal aluminium powders are, however, highly reactive in water and even explode when thrown into water. Aluminium dust can even explode in the air at certain concentrations if an ignition source (e.g. a spark) is provided. Both the aluminium powders that we sell are coated to make them stable in water (waterproof). Being water stable also means that they will be stable in any arts or crafts you use them in. This aluminium pigment is coated aluminium powder that has been pre-mixed into water to make a very thick paste (so thick that it can be cut with a knife). It is 70% aluminium powder and 30% water. It has a deep silver colour and imparts exceptional hiding power. One advantage of using a paste is that there is no dust generation. As it contains water it can only be used in systems that are fully compatible with water and it will not work in resins. It is an extremely cost effective pigment. It may be better to describe this paste as solid looking lumps that can be cut with a knife. Some of the lumps are small (like granules) and some large but this makes no difference. Although the lumps may look like solid metal they definitely are not and they can be broken up into individual powder particles in water. The "lumps" can be worked into a powder in water by soaking and pressing them with the back of a teaspoon for example. After doing this the water will look like liquid metal when stirred and the water/aluminium powder mix can be incorporated into water-based paints and other water compatible media. Although this aluminium pigment is stable in water it is not stable in all chemicals so once added to a medium (e.g. to a water-based paint) the medium should be used within a few hours. It is stable for storage in paints with certain properties but most paints and mediums need to be used within a few hours. 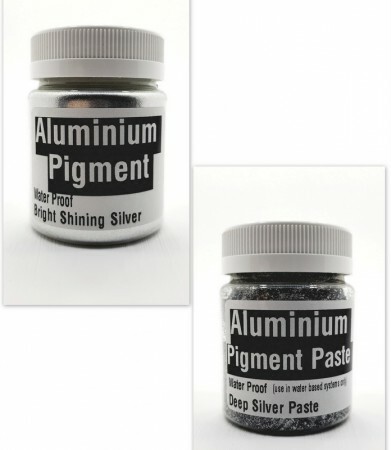 This aluminium pigment is aluminium powder that has been coated to make it water compatible. It has the best possible silver shine and lustre; nothing can beat it. It can be used to create a really bright silver colour with wonderful hiding power and shimmering sparkle. It gives a liquid metal appearance. It is compatible with some epoxy resin systems but compatibility testing needs to be performed before large scale use. It can be used in almost all water-based mediums although long-term storage in wet mediums is not guaranteed. Mix what you need and use it within a few days. This pigment generates dust so take precautions to avoid breathing the dust.